They did it. It took an additional game and a little help from the Giants and Nationals, but the Dodgers are back in the postseason for the sixth straight season. In a 2013 NLDS rematch, the Dodgers host the Braves in Game 1 of the National League Division Series. It’s been an odd and difficult season. It started off poorly after Justin Turner broke his wrist in spring training, they lost Corey Seager for the year, and ominous sewage spewed forth from the field before Opening Day. Cody Bellinger battled a sophomore slump that saw his isolated power dip 105 points and his OPS fall 55 points a year removed from his Rookie of the Year performance in 2017. Chris Taylor, co-MVP of the NLCS, also struggled to find consistency at the plate. His 178 strikeouts were the most in the NL. The bullpen was one of the biggest success factors for the Dodgers last season, but this year saw the relief squad in disarray at times without their anchor. Kenley Jansen dealt with an early season hamstring injury and a recurrence of atrial fibrillation this summer that affected his performance on the field. Even Clayton Kershaw wasn’t immune to the so-called “World Series hangover,” and we saw a decrease in his velocity and effectiveness. Unlike last year, when the Dodgers were a virtual lock for the division in late-July, this one had to be played out and fought for until the bitter end and then some. While there were certainly stories of struggle exasperated by frustrating injuries for the Dodgers this year, there were also tales of redemption with breakout seasons from Max Muncy (162 wRC+), newly anointed ace and potty mouth Walker Buehler (0.961 WHIP), Ross Stripling and his 10 K/9, and everyday player Enrique Hernandez who slugged a career-high 21 home runs. Hyun-Jin Ryu and Matt Kemp had comeback years, and Yasiel Puig kept out of trouble and bounced back. Joc Pederson quietly put together a great year with career highs in slugging (.522) and average (.248). Even Pedro Baez (9.9 K/9 and 0.6 HR/9) was effective out of the bullpen. The front office also added some key contributors down the stretch including Manny Machado to shore up shortstop and a sleeper surprise in David Freese who had a 1.130 OPS with the Dodgers in 19 games. Kenta Maeda excelled out of the bullpen, and Yasmani Grandal led all major-league catchers with 24 home runs. On August 22, the Dodgers were 4 1/2 games back of the division lead. They rebounded to win 19 of their last 28 including a tiebreaker against the Rockies to clinch the division, allowing them to bypass a stressful wild card game. They’re playing well and looking for it to carry over. If you missed it earlier, both teams announced their NLDS rosters. The Dodgers went with 12 pitchers and 13 position players. The only real surprise is the exclusion of Stripling and addition of Ryan Madson in the bullpen. Stripling had a solid first half and earned his first All-Star nod, but went 0-4 with a 6.41 ERA and 1.575 WHIP in 26.2 innings in the second half. It’s probably due to fatigue down the stretch after throwing a career-high 122 innings, because Stripling wasn’t the same after the break. It was a hard decision to leave him off the roster per Roberts, but he may be added to a potential NLCS or World Series roster should they get there. Random note RE: why Ryan Madson is on this roster, beyond just prior experience. His changeup has yielded an xwOBA of .174 this season. Per @InsideEdgeScout, since the All-Star Break, the Braves have a well-hit average of just .099 on changeups (t-4th-worst in baseball). Plot twist: Ryu will start for the Dodgers in the NLDS opener, not Kershaw. Kersh will start Game 2 and wouldn’t comment on why management made the decision. “I don’t need to prove myself to anybody,” Kershaw said. Ryu has been dominant for two months since returning from a serious groin strain. He will make his first postseason start since 2014, when he went six innings against the Cardinals. He was limited to just one start in 2015 and 2016 after shoulder and elbow surgeries and was left off the 2017 postseason roster after going 5-9 with a 3.77 ERA in the regular season. The southpaw’s only allowed 12 runs in nine starts at Dodger Stadium this year, and didn’t allow any runs in five of those nine starts. Ryu has struck out nearly 10 batters per nine innings, and has put up career best numbers in ERA (1.97), FIP (3.00), WHIP (1.008), strikeout percentage (27.5%) and walk rate (4.6%). Overall, in his career, Ryu is 0-1 with a 2.95 ERA with 18 strikeouts in 18.1 innings in three starts against the Braves. Freddie Freeman is 5-for-8 (.625) with a double vs. Ryu. Old friend Charlie Culberson is 3-for-7 (.429) with a triple against him as well. Ryu faced the Braves in Game 3 of the 2013 NLDS, only going three innings and allowing four runs on six hits with a strikeout and a walk on 68 pitches. He wasn’t involved in the decision, and the Dodgers went on to win 13-6. Mike Foltynewicz (13-10, 2.85 ERA, 3.37 FIP) has become one of baseball’s top starting pitchers after a breakout season. The All-Star right-hander tweaked his windup and has been more effective and consistent with his slider and changeup along with his fastball that can near 100 mph. He struck out 202 batters in 183 innings, good for 9.9 K/9. He even notched two rare complete games, including a complete game shutout against the Nationals on June 1, striking out a career-high 11 batters. Foltynewicz has five seasons at the major-league level, but this will be his first career postseason start. Freeman had some good words to say about him ahead of the NLDS. The Dodgers faced Foltynewicz once this season on July 27 in Atlanta. They roughed him up to a tune of four runs on six hits including two home runs by Alex Verdugo and Yasmani Grandal over five innings in the Dodgers win. Overall, in his career, Folty’s 1-1 with a 5.56 ERA and 1.50 WHIP in two starts against the Dodgers and has struck out 13 LA batters in 11.1 innings (10.3 K/9). Manny Machado is 4-for-6 (.667) vs. the righty. Grandal has two hits in six at-bats, both homers against him. 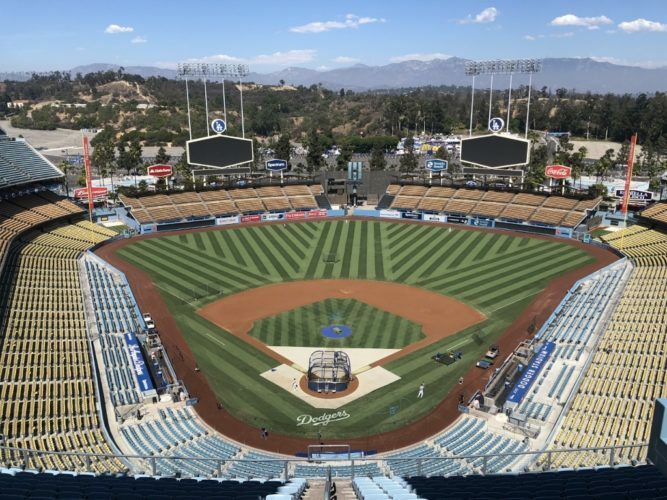 The Dodgers went 5-2 against the Braves during the regular season and were 2-1 against them at Dodger Stadium in a June series when Stripling and Alex Wood started. Buehler started the other game against old friend, and new retiree, Brandon McCarthy. He allowed one run on two hits in 5 1/3 innings in the 7-3 LA win. Dustin wrote up a great preview of the series earlier today. On paper, it looks as though the Dodgers should win this series, but the Braves are a good young team and shouldn’t be taken lightly. Game 1 of the division series will be televised on MLB Network, and Games 2-5 will air on FS1 with Joe Davis and John Smoltz in the booth. If the Cubs had won, I was on a 6am flight to Milwaukee. Rockies win, and Smoltzy and I will talk to you from Dodger Stadium this weekend. They’re finally out of the regular season woods and back to postseason baseball. They’ve been here six straight times prior, but there’s still that darn redemption arc that looks to be completed. I hope they channel their inner Juan Uribe this series. Boy, do I miss him.